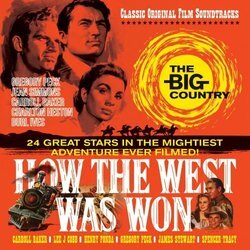 Jasmine Records have released a few soundtracks of late and this next instalment covers the two epic westerns, 'The Big Country' & 'How The West Was Won'. First up is Jerome Moss' Oscar nominated soundtrack for 'The Big Country'. A sprawling high budget western adventure produced and directed by William Wyler. Starring Gregory Peck, Charlton Heston, Jean Simmons, Carroll Baker, Charles Bickford and Burl Ives, the film was a major box office hit yet the soundtrack never charted. The second soundtrack on this collection is Alfred Newman & Ken Darby's 'How The West Was Won' was an equally high budget and sprawling western starring James Stewart, Henry Fonda, Carroll Baker, Debbie Reynolds, John Wayne and Gregory Peck and did chart peaking at No. 4 on the Billboard Top 200 Album Chart. The film itself was also a big success being nominated for eight Academy Awards and eventually winning three. If you're a fan of westerns then this set is a must have.